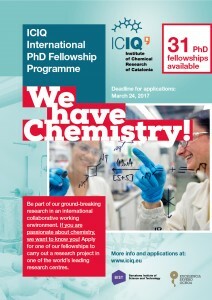 The ICIQ established its PhD fellowship programme with the aim to support excellent students from all over the world to enrol in a training and research programme in the area of chemistry. The programme ultimately leads to the completion of a Doctoral Thesis in partnership with the Universitat Rovira i Virgili (URV). Our fellowships are addressed to highly qualified and talented graduate students with an enthusiastic interest in chemical research. 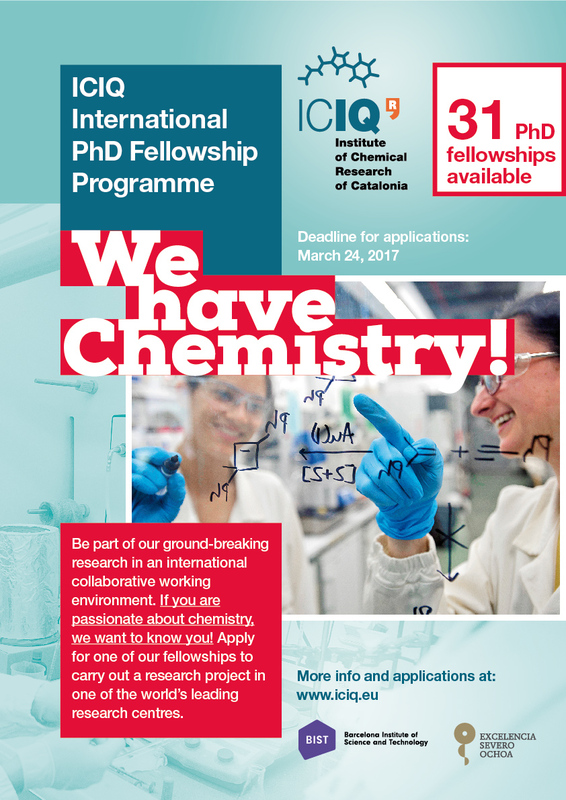 Motivated students have the opportunity to join one of the research groups at the ICIQ and follow an individual research project under the direction of an ICIQ group leader in a creative and stimulating scientific environment. Innovative metal-catalyzed reactions for the activation of inert bonds and molecules: C-H functionalization, carbon dioxide activation. Organocatalysis to develop novel enantioselective reactions. Catalytic transformations of carbon dioxide to valuable fuels and chemicals. Synthetic receptors and sensors for the detection of molecules related to human health. Supramolecular approaches for enantioselective catalysis. New metal-catalyzed reactions for the synthesis of biologically active compounds. Photochemical catalysis in new flow processes. Computational studies on homogeneous and heterogeneous catalysis. Development of smart materials for energy-related applications. Admission to the programme is on a competitive basis. All applications will be evaluated solely on the basis of academic and research excellence of the candidates. The selected graduate students will be awarded a contract for full-time studies in order to achieve the Doctoral degree.